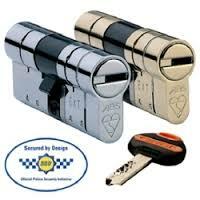 ABS Secure Euro cylinders are available in all sizes and both Nickle and Brass finishes. These are one of the most secure cylinders on the market. When ordering, the internal size is first and the external with the break secure feature second. An example would be 4055 (overall length 95mm) with 55mm from the front to the centre of the screw hole. Delivery on some cylinders can take 7 days. Please phone us if you need it quicker.